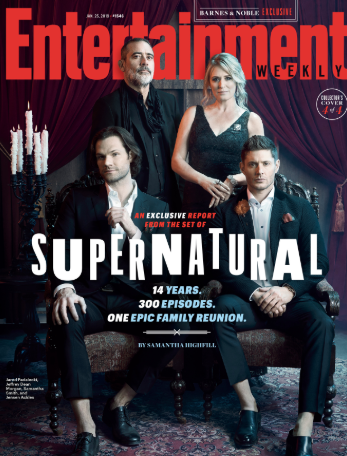 -I don’t watch Supernatural but their EW photo spread is super fun. Also, 300 episodes is insane! -This report is coming from the Daily Mail so digest accordingly, but sources claim that Miley Cyrus and Liam Hemsworth are expecting their first child. –Justin Bieber and Hailey Baldwin might be celebrating their marriage with a ceremony on Feb 28th. -This is a bummer but not surprising: Julia Roberts is not expected to return for Homecoming’s second season. I’m ok with that; I adored her final scene. -In a cute tweet, Amanda Seyfried reunited with her two onscreen dads, Hugh Jackman and Pierce Brosnan, at the airport. –Ewan McGregor‘s daughter is not over the fact that he left her mother for Mary Elizabeth Winstead. –Ellen Pompeo is having second thoughts about leaving Grey’s Anatomy. –Roswell’s ratings aren’t exactly out of this world. They improved on Black Lightning, but that’s a low bar. -I am very here for the rest of the world finally discovering Schitt’s Creek. Also, this is a great profile on Dan Levy (though I would have asked 97% more questions about how he and Jessi Cruickshank kicked off the aftershow craze with The Hills). -The new Spider-Man movie has trans actors, which is amazing. -SMILF creator Frankie Shaw addressed those misconduct allegations on her set: “I was learning on the go.” Seriously Hollywood, stop hiring writers to run things without giving them basic management training. -Meanwhile, Sundance is standing behind their new Michael Jackson doc. Expect there to be an R Kelly-type reckoning when this thing drops. –Margot Robbie wants people to stop asking her when/if she’s having kids now that she’s married: “Don’t presume. I’ll do what I’m going to do.” Word. –Michelle Pfeiffer just joined Instagram and her first post is purr-fect. -The trailer for Better Things season 3 made me laugh out loud — which is typical for this show. -There’s a new trailer for the final season of Unbreakable Kimmy Schmidt. -Canadian PSA: Showcase is airing the new season of Luther, starting on Monday. -It turns out that Jason Reitman has been secretly working on a new Ghostbusters movie — which the world found out about last night when the teaser dropped. Rumour has it, it will be centered around four teenagers. -I didn’t understand Ayra‘s “that’s not you” line to her direwolf on GoT last night but now that I read the explanation I’m crying. -Sorry, One Direction fans: Louis Tomlinson has shut down rumors of a romance with Harry Styles. –Lena Dunham referred to Jack Antonoff’s sibling as her “sister-in-law” on Instagram, and then had to deny speculation that she got married. -I really, really liked this thread responding to Christopher Nolan‘s Netflix comments. -I guess this is Kevin Hart’s response to those cheating allegations? -Girls Trip (which I liked A LOT) had the biggest opening weekend for a live-action comedy this year despite its R rating, and already earned back what it cost to make. Add the fact that Wonder Woman and Beauty and the Beast are the year’s top-grossing films so far, and the box office is looking downright rosy for women-led flicks. -The “friend from work” line in Thor: Ragnarok (aka – the best line in the entire trailer) was actually pitched by a Make-a-Wish kid who was visiting the set the day they shot that scene. -In news that came out of ComicCon, Michelle Pfeiffer is joining the Ant Man sequel, Patty Jenkins has weirdly not signed on to Wonder Woman 2 yet, Henry Cavill’s mustache is causing problems for Justice League, and Ben Affleck insists WB isn’t replacing him (“‘We want you to be the Batman’ they told me, and I believe them.”) Also, I would *love* to know which TV cast was yelling at each other before their TV Line interview. -Speaking of TV casts behaving badly at the con, the Supergirl crew really stepped in it while doing a musical recap of their season, in which they mocked fans who ship Kara and Lena. I still need to catch up on that show, but this seemed incredibly mean-spirited. Who cares if the writers will never have Supergirl hook up with a woman onscreen? Let people watch for whatever reason they like and/or hope for whatever outcome they want. The fact that they were mocking a marginalized group that has really embraced that show made it even worse. The cast’s apologies were not great (gotta love the “I’m sorry but think about ME” tactic). Jeremy Jordan‘s first note was especially victim-y, but at least he got it right on the second try. -Everyone is talking about this adorable video of the little girl crying over the Justice League cast, but I like this video of Jason Momoa meeting the little kid who asked about Superman during the panel. -So much trailer goodies dropped at ComicCon this weekend. On the TV side, we got trailers for the new seasons of Stranger Things, The Flash, Arrow, Supergirl, Doctor Who’s xmas special, Legends of Tomorrow, Westworld, Lucifer, Once Upon a Time, Preacher, and The Defenders.